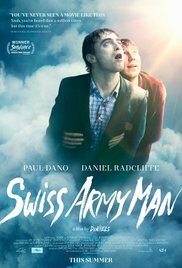 Thanks to Melbourne’s Cinema Nova we have a very special giveaway this week – a Swiss Army Man giveaway. If you’re a Melbourne listener of The Good The Bad The Ugly Film Show make sure you take a listen this week if you would like to win a double pass to a special screening of ‘Swiss Army Man’ starring Paul Dano and Daniel Radcliffe. The screening will be held in Melbourne on Thursday the 7th July. If you can make the screening and would like a chance to win the tickets just listening to this week’s show and answer the question Dave asks by sending us a private message at either our Facebook or Twitter page. This week on The Good The Bad The Ugly Film Show Adam, Dave, Greg and Nick take a look at new release films ‘The BFG,’ ‘The Measure Of A Man,’ ‘Central Intelligence,’ and ‘The Wait’. This episode also contains interviews with Steven Spielberg, Dwayne Johnson, Kevin Hart, John Cabrera (Melbourne WebFest), Thomas Caldwell (MIFF), Jack Sargeant (Revelation Film Festival), Emma Vestrheim (Scandinavian Film Festival), Em Baker (‘Spoke’ ), Jason Burrows (‘The Member’), Nora Niasari (‘The Phoenix’), Jeff Hann (‘The Coffee Man’), Kier-La Janisse (Monster Pictures), Perri Cummings (‘Trench’) and Paul Anthony Nelson (‘Trench’). The music and cinemas worlds collide again on June 25 when Love & Mercy hits Australian cinemas. The film tells the story of Brian Wilson, the man behind the legendary The Beach Boys. Starring Paul Dano, John Cusack, Elizabeth Banks and Paul Giamatti Love & Mercy is one of the most eagerly anticipated movies of 2015 and thanks to Icon Distribution you can have a chance to see it on us. That’s right thanks to Icon Distribution The Good The Bad The Ugly Film Show has a number of passes to Love & Mercy to giveaway. Five lucky winners will also receive a The Beach Boys’ Greatest Hits CD to go with their passes. For you chance to win in our Love & Mercy giveaway simply listen to The Good The Bad The Ugly Film Show Ep #134. Icon Film Distribution is proud to announce that the Australian premiere of LOVE & MERCY will be held at Sydney’s State Theatre on Sunday June 7, 2015. As announced last month, the film will be featured as part of the 2015 Sydney Film Festival with its first festival screening serving as the Australian Premiere. We all know the music, but few know the true story of musical genius, Brian Wilson and his struggles with brilliance and balance. Whilst his music shaped our lives, it would be the love of one special woman who saved his. First time director, Bill Pohlad puts his experience as a producer on films such as 12 Years a Slave, The Tree of Life and Brokeback Mountain to good use. In LOVE & MERCY he paints an unconventional portrait of Wilson, interweaving seminal moments from his youth and later life. 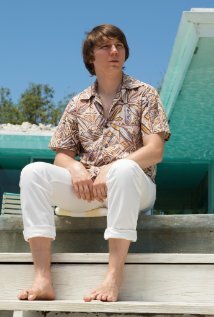 The role of Brian Wilson is masterfully shared between Paul Dano (12 Years a Slave, Little Miss Sunshine) as the younger, 1960s Brian; and John Cusack (Maps to the Stars, High Fidelity) as Wilson in the 1980s. The film explores the many challenges Brian has faced, both from his point of view in his younger years; and from the perspective of his now wife, Melinda (Elizabeth Banks) when she meets Brian in his 40s and under the questionable medical care of Dr. Eugene Landy (Paul Giamatti). The Beach Boys were already experiencing chart topping success with Surfin’ Safari, I Get Around, Help Me Rhonda, California Girls and Good Vibrations when Brian found himself driven to move in a new musical direction. Whilst this would ultimately lead to the creation of what is widely ranked as one of the greatest albums of all time – Pet Sounds – and songs like Wouldn’t It Be Nice, Sloop John B and God Only Knows; it also lead to the band breaking up and Brian breaking down. 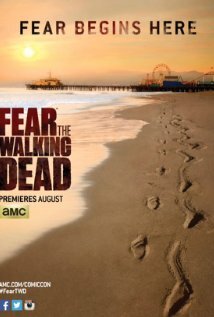 The films shows Brian becoming more and more isolated from his family and friends to the point where he seems to have been signed over into the care of Landy who seems determined, through overmedication and other manipulations, to keep Brian away from all real connections to the world. When Melinda Ledbetter enters his life, their mutual attraction becomes a bond that the oppressive doctor cannot break. As few biopics about musicians do, LOVE & MERCY offers a hopeful and happy ending – one that continues to play out in reality today. Brian Wilson’s music continues to resonate with existing as well as new audiences every day. Wilson’s 11th solo album, NO PIER PRESSURE was released earlier this year to critical acclaim. One Kind of Love which is featured on the new album and also in the film has just been recognised as “Best Original Song” at the Nashville Film Festival. More importantly (and even more rare) Brian and Melinda are still together and still in love. LOVE & MERCY debuted to a standing ovation at the Toronto Film Festival and has continued to garner critical acclaim including from its showings at the Berlin Film Festival and the South By Southwest Festival. Words used to describe LOVE & MERCY include, “compelling” (Collider); “dreamy and delirious” (Indiewire); “deeply satisfying” (The Hollywood Reporter); “emotionally exhilarating” and “exquisite” (HitFix); “engrossing” (Indiewire); “extraordinary” (The Washington Post) “tender” (BBC.com) and “touching” (Screen International). Critics have also hailed the dual performances from Dano and Cusack as, “career-topping performances”; (Indiewire); “groundbreaking” (The Washington Post); “phenomenal” (Bloody Disgusting) and “uncanny” (Mashable Australia). Best known for her work as a comedic actress, Elizabeth Banks has also attracted praise for her career-redefining dramatic performance she gives in the film. It seems likely that its screenings at the Sydney Film Festival will no doubt attract similar accolades for LOVE & MERCY including the film’s unique style and excellent performances. 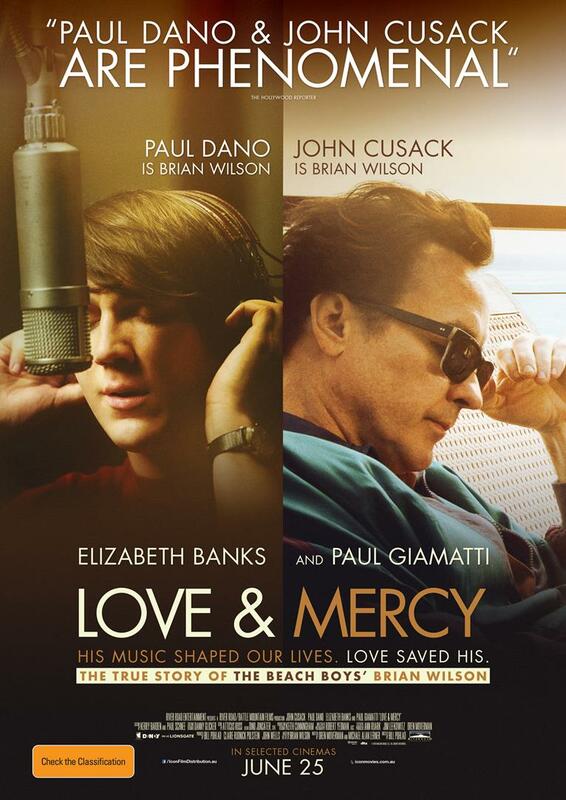 Icon Film Distribution is proud to announce the June 25 release of LOVE & MERCY starring both Paul Dano and John Cusack as The Beach Boys’ Brian Wilson. We all know the music, but few know the true story of musical genius, Brian Wilson and his struggles with brilliance and balance. The film paints an unconventional portrait of the artist by interweaving seminal moments from his youth and later life, as it explores how Brian came to be who he is today. The role of Brian Wilson is masterfully shared between Dano (12 Years a Slave, Little Miss Sunshine) and Cusack (Maps to the Stars, High Fidelity) as the film explores the many challenges Brian has faced, both from his point of view in his younger years; and from the perspective of his now wife, Melinda (Elizabeth Banks) when she meets Brian in his 40s and under the questionable medical care of Dr. Eugene Landy (Paul Giamatti). Musicians, critics and fans alike have consistently hailed Wilson as one of the most innovative and influential creative forces in music. His songs remain as relevant and resonant today as they were over 50 years ago; continually finding new audiences as evidenced by the 2014 BBC Music All-Star cover of God Only Knows that became an internet sensation. The teaser trailer has just debuted online and has already gone viral. A proud Brian Wilson has also posted the teaser on his own Facebook and website. The film release will follow the April 3 launch of Wilson’s 11th solo album, No Pier Pressure. In addition to featuring an awesome soundtrack, LOVE & MERCY offers an intimate and unforgettable glimpse into the musical and personal evolution of one of the greatest creative minds of our time. You can view the Love & Mercy teaser trailer below.